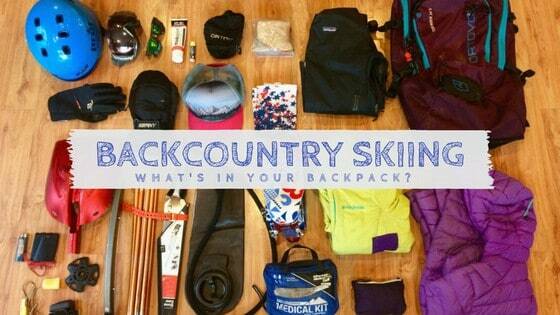 What’s in my backcountry ski pack? 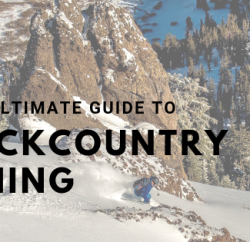 Backcountry ski gear can be overwhelming. 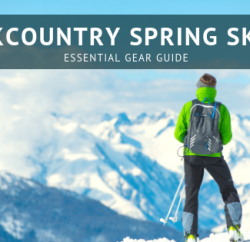 With dozens to hundreds of options for each single item — skis, boots, bindings, base layers, outerwear, helmet, goggles, gloves, beacon, shovel, probe, etc., etc. — making choices about what to buy and what to wear can be a nightmare if you’re not a gearhead. Which is why I like to keep it simple. 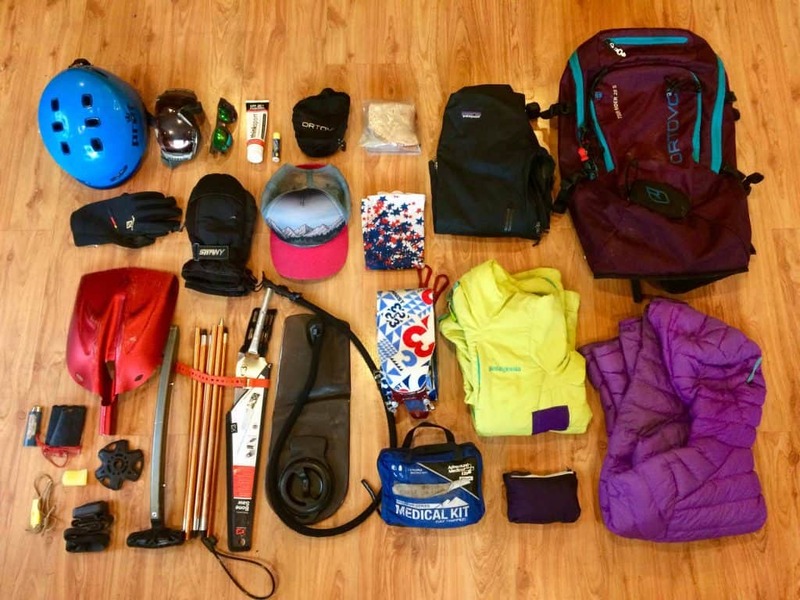 No matter the weather, no matter the conditions, no matter the route, I rely on a handful of core items that make it into my backpack every single time I ski in the backcountry. 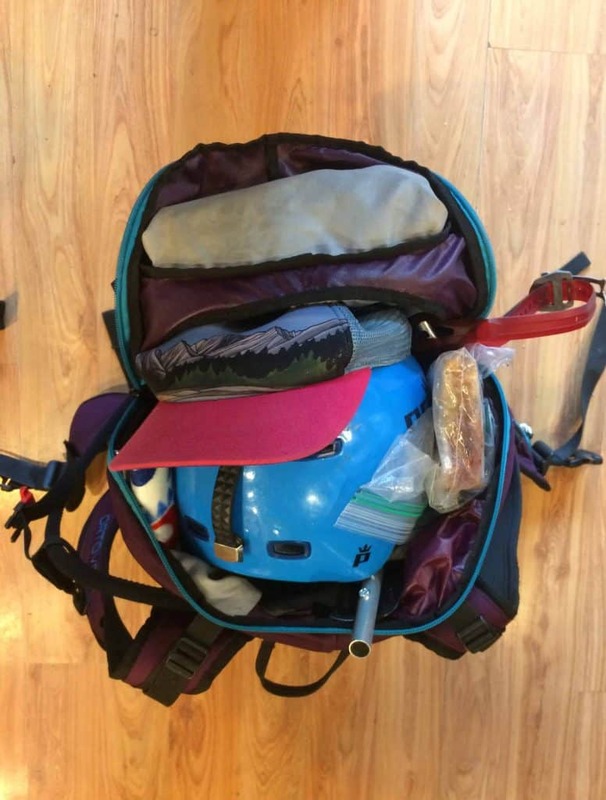 As a matter of fact, most of them live in my pack permanently — I tend to keep it packed and ready to go, so I’m always only 15 minutes from out the door. Let’s start with the pack; why I chose this particular model, what I like best about it, and how it could be improved. Then I’ll discuss what I keep inside it, and why. Overall, this pack is almost perfect. It’s super light to keep weight to a minimum, comfortable enough to carry all day, and has exceptional storage capabilities. For 95% of my ski days, the Tour Rider has enough space for all my belongings plus more. It comes with an exterior helmet sling, but I’ve always been able to fit my helmet inside, given the pack’s fantastic clamshell-shaped design. The belt pocket is perfect for a snack, chapstick and my iPhone 5S (though newer, larger phone models might not fit). With straps and buckles only where I want and need them, it’s a clean design that doesn’t include extraneous gimmicks. If Ortovox updates this pack down the road, two minor modifications could result in major improvements. The current system for avy tools (shovel and probe) is only so-so. The sleeves for the shovel handle and probe were too wide to hold my tools securely, so I made some aftermarket safety pin modifications. And the designated spot for the shovel blade meant unpacking and repacking the pack every time I wanted to use my shovel. To get around this, I keep the blade in the exterior pocket (which might not work for a larger shovel). Expanding the outer pocket to fit all the avy tools would be big step forward. My only other suggestion is that Ortovox could make its “small” design even smaller. I’m on the petite side, but at 5’3” and 130 pounds, I’m not tiny. I usually cinch down my shoulder straps and waist belt as far as they can go. 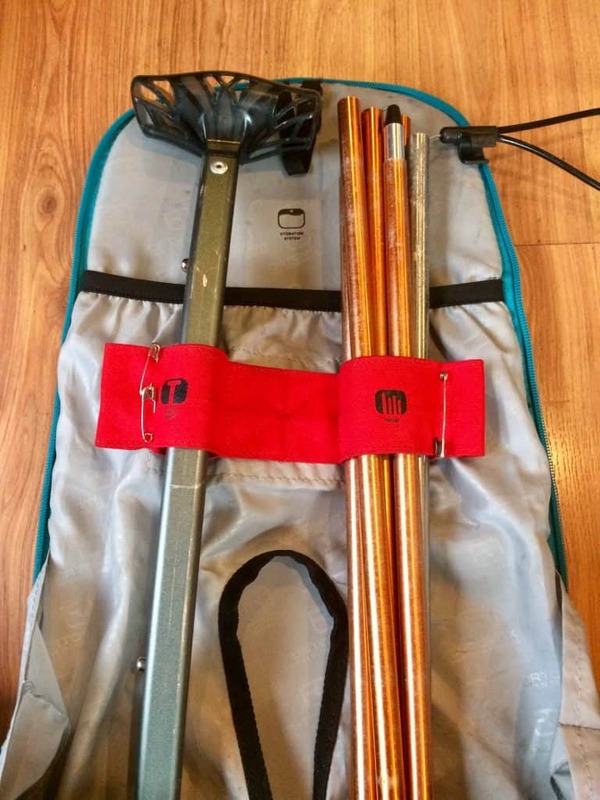 Given that the Ortovox Tour Rider 28 is a bit large for my frame, plus its superlight construction, on days when greater weight distribution is essential I opt for my more structured and ergonomic Gregory Targhee 45 (if I’m carrying heavier items like crampons or skis on my back for a long bootpack). Black Diamond Deploy Shovel and probe. Honestly, I don’t much care what kind of shovel and probe I have, so long as I have them and know how to use them. The most important piece of preventative safety equipment. Digging snow pits is the best way to evaluate the snowpack you want to ski on, and a snow saw makes doing so fast and easy. G3 Alpinist skins. Lightweight and get the job done. Helmet, goggles, sunglasses. Protect your brain and your eyeballs. Helmet sling. I’ve never used it but I still keep it in my pack (maybe I should rethink that). CamelBak Antidote Reservoir (2L). A water bIadder is the only thing standing between me and dehydration. The neoprene insulation helps keep water liquid in cold temps, but it can still freeze in the tube and mouthpiece. To prevent this, blow air into the tube after you drink to push water back into the reservoir. Thank me later. Patagonia Houdini Jacket. Most brands make an ultra-light windshell. This one is hands down, 100% worth it. It packs down to the size of a fist, keeps the wind out like a pro, and is always the first layer I reach for. Be sure to get one with a hood. Patagonia Nano-Air Hoody. Most brands also make their own version of this ultralight jacket with breathable, synthetic insulation, and I can’t recommend one highly enough. The range is incredible: I wear this jacket as a midlayer at 5 degrees, on its own at 45 degrees, and it’s breathable enough to sweat in on the way up. It’s my second go-to layer. Salomon Halo II Down Hoody and/or Patagonia raincoat. When combined with the synthetic Nano-Air Hoody, this mid-weight down jacket is all I need for insulation, even mid-winter. For spring skiing, I’ll bring the extra insulation if I’m anticipating colder conditions (because I hate being cold). If the weather’s looking warm, I’ll skip the puffy and bring the raincoat as a lightweight shell. Gloves. Nordic ski gloves are the best gloves I’ve found for skinning in all temps, as well as spring descents. I rotate between Salomon and Toko gloves, depending on the temperature. Because I run cold, I also carry a backup pair of heavy-weight mittens, just in case. My go-to pair from Swany are 15 years old (I kid you not) and still warm and waterproof. Hat. Cool trucker of your choice — I love Annie P. Hats out of Bishop, California, featuring familiar mountains and landscapes of the Eastern Sierra Nevada. For cold days, I’ll swap it out for something warmer. Neck gaiter. Warmth and/or sun shade, depending on the day. Never leave home without one! Sun protection. Thinksport SPF 50 is easily my favorite sunscreen. Titanium oxide is real-deal sun protection for my fair skin, and it actually rubs in all the way. That, along with Dermatone chapstick, and I’m all set. Repair and maintenance. 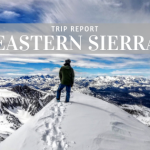 Skin wax, like Globstopper from Black Diamond, is an absolute must-have for spring skiing in the Sierra. It will save your day when snow attempts to glop up your skins and prevent you from going anywhere. You can also carry a chunk of Toko NF Yellow wax. 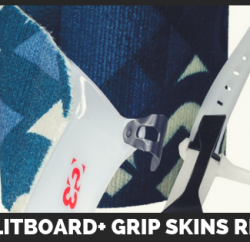 It’s designed for ski bases, but it gets the job done admirably on skins. I also carry a spare pole basket. Self rescue. Black Diamond Spot headlamp, Suunto compass, whistle, lighter, Swiss Army knife or Leatherman, or something similar with blade(s), screwdriver and other tools. First aid. Athletic tape, Band-Aids, Moleskin, gauze, combine pad, SAM splint, Ibuprofen, Gu gel shots for quick energy, hand warmers, scissors. Snacks. PB&J, assorted bars, chocolate, Snickers, apples, and gummy bears. Because no one has (is) fun when they’re hungry. It may be hard to believe, but all this gear easily fits inside my Ortovox Tour Rider backpack — pretty impressive for only 28 liters! 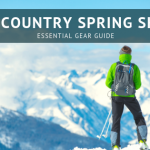 All of this gear is available online through one of our affiliate partners by clicking one of the links above or stop by Tahoe Mountain Sports in Truckee and we’ll help you get set up to tour in the backcountry! 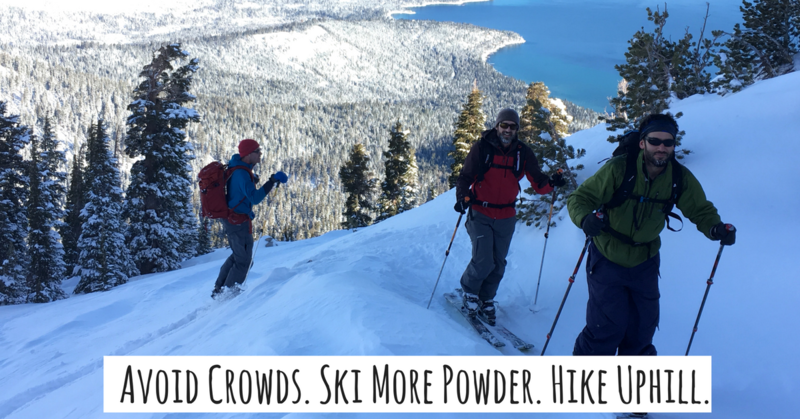 We also rent backcountry touring skis, splitboards, backpacks, cross country skis, snowshoes and more! 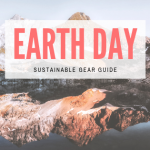 Click the image above to read about the specific gear we rent and start planning your adventure today. Click here to rent backcountry ski gear today! 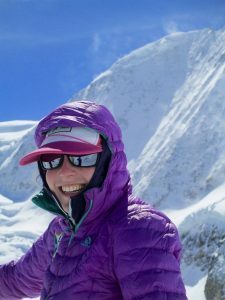 Emily Blackmer is a devotee of human-powered mountain adventures, especially backcountry skiing, cross-country skiing, and running. Once she’s tired out, you’ll find her lying on the couch with a book, cooking from scratch, working at Truckee-based tech company Recyclist, or thinking about how to solve environmental challenges. A New Hampshire native, she spent a summer in Truckee during college and never looked back. Snow is her favorite weather. Follow along on Instagram at @emilyblackmer. 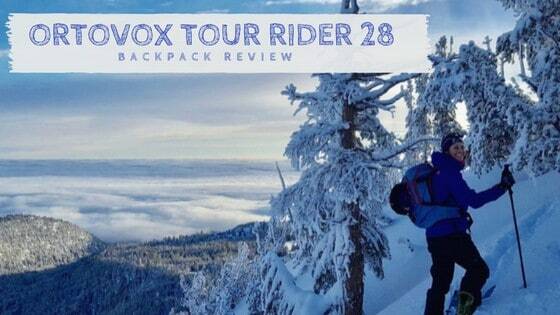 Here’s another review of the Ortovox Tour Rider 28!